This isn’t a review, but an indulgent reflection on what Your Name. means in the context of my struggle to find intrinsic worth in the things I spend time on. I don’t consider myself an anime fan - I’ll watch things that look good, but I constantly find myself searching for works that justify the time my association with it. How can I justify following, or liking things, that have many elements that I find unsavoury, and that society has perhaps convinced me are deserving of some sort of stigma? This isn’t a thought directed exclusively towards anime - I find it lingering in the time I spend with entertainment in general. I hope to find things that inspire me to feel there is some intrinsic good to the time I spend with anime in my struggle to find worth in all of this. This happens from time to time - recently, The Legend of Zelda: Breath of the Wild and Persona 5 have filled me with a satisfaction as I play through them. I don’t question if it is all for nothing, or if there is something wrong with me for enjoying them - I find, to me, there is something inherently good in these works that resonates with how I construct the world around me. The time I spend on them is worth it because of how inherently good they feel. I don’t feel this way, for whatever reason, with the majority of anime. This is othering in some sense in the scope of a fandom that inspires a dedicated level of fervour, and I struggle to place myself within this with my reservations. I went to see Your Name. on Tuesday. 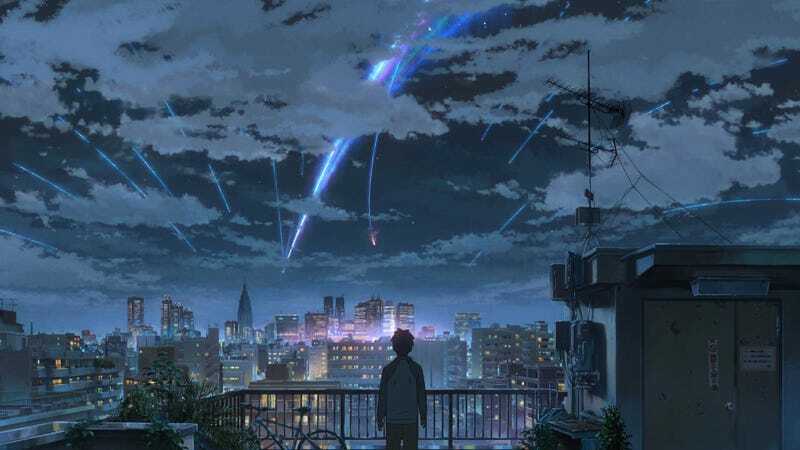 I’m not surprised it was good - in fact, I would have been much more surprised if it wasn’t given director Makoto Shinkai’s demonstrated skill at crafting stories that, at least to me, engage with human emotion on a level that strikes me as having significant substance and texture. It struck me more than I expected - I found myself in a good mood the following day, and after a little bit of reflection I realized that I simply felt fulfilled by the emotional affectiveness of the movie. The animation melted my eyes. The characters made me laugh. The story had meaning to me, and also engaged with themes of the self in a way that gave me substance to engage with beyond a base level of entertainment. But, on the whole, it just felt good in a way that made me think that yes, anime has an inherent good in my life. I can’t quantify this fulfillment I’m searching for. Perhaps, I just want to engage with things that teach me something about the world, about emotion, and about myself in the process of experiencing it. But, Your Name. struck me as one of these things that restores my faith in the worth of anime as a good to me, and for that, I am satisfied.